Hello all! I was out shopping until late last night and just didn’t get my planned post up in time- so I’ll be doing my Go Pink Wednesday today! As you can probably see on my side bar, I’ve opted to join a bunch of other awesome bloggers for ‘Go Pink Wednesday’ for the month of October. To start today’s mani, I pulled out a beautiful pink Essie polish- Pink A Boo! This color was part of Essie’s Spring/Summer 2012 Resort collection. While it’s not as easy to find in stores now, you can still grab this pretty color online! Pink-A-Boo is a gorgeous sheer baby pink filled with a fairly strong blurple shimmer- especially for Essie! This polish is very sheer, though. The pictures show 4 coats- anything under that showed visible nail line, and you can still see a bit of VNL. Then, to add some ‘bling’, I decided to put a coat of Essie’s A Cut Above on top of Pink-A-Boo. 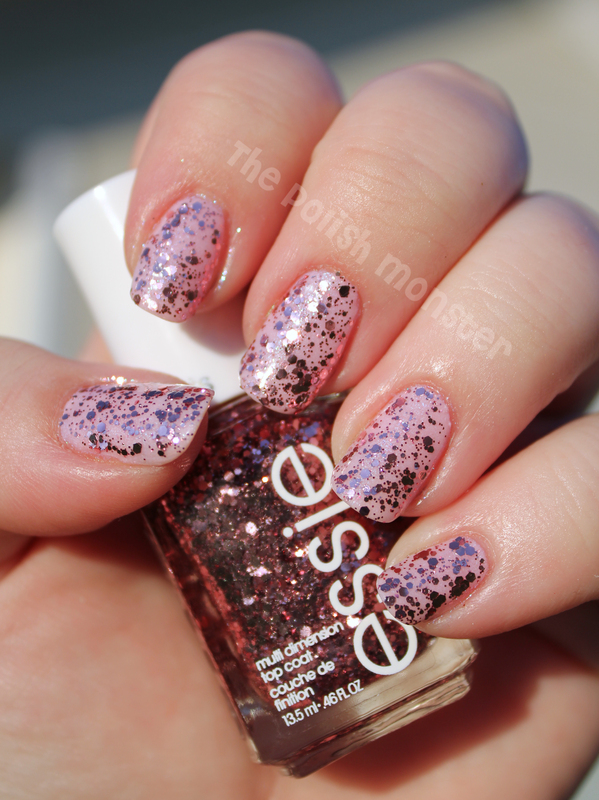 A Cut Above is a layering glitter, and part of Essie’s LuxEffects collection. It’s filled with multiple sizes of pink hex glitter! Essie can be purchased at most US drugstores, like Walgreens, CVS, Target, and Walmart for around $8 a bottle. Be sure to check out all the other awesome ladies taking part in Go Pink Wednesday! This entry was posted on October 4, 2012 by The Polish Monster. It was filed under Uncategorized . Thanks!!!! I just cut them a tiny bit today to even them up a bit more, but I’m blown away by how much Rejuvacoat has helped! !